Glenn Draper was born with music in his blood. From childhood to adulthood, he conducted quartets. 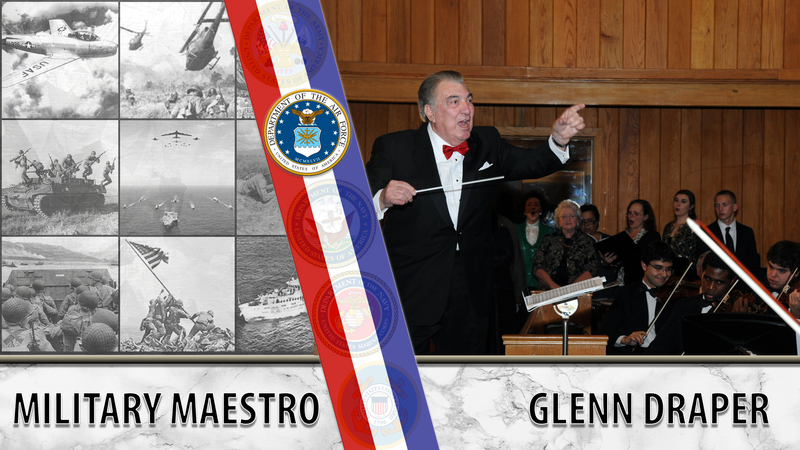 When he joined the United States Air Force in 1952, the music followed him to Keesler Air Force Base. While there he played in a band. More than once he tried to convince the band to let him organize an all-male chorus and was met with a decisive denial each time he asked. Then, the day came when he was turned down and he ambled away to the canteen to be alone with his disappointment. It was there that he started up a conversation with a woman by saying, “Wouldn’t it be grand to have the best all-male chorus right here at Keesler?” who turned out to be the base commander’s wife. She told Draper she’d speak to her husband and see what she could do with the caveat that he had to sing Christmas carols at her house. He agreed and shortly thereafter the Keesler Male Chorus was formed. They performed not only at the base commander’s functions, but also across the United States for dignitaries, appeared on the Ed Sullivan Show and had a weekly time slot with NBC. Draper’s chorus had a thirty-year run before having to comply with a policy to allow women into the group and became the Keesler Chorale. It disbanded shortly thereafter. Draper didn’t stop there. He continued his education and became a teacher. For a while, he led the Glenn Draper Singers and went on to tour Russia with Billy Graham.